« Atelier Circulaire and Friends Visit New York. Gelli plate with work in progress. 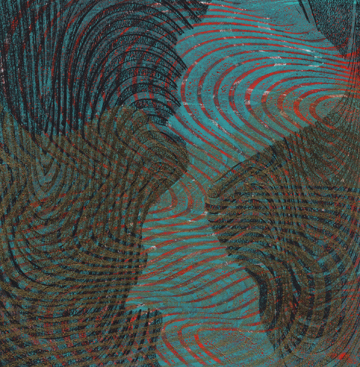 As the notion of the traditional edition of identical prints is being questioned by many printmakers, more and more artists are including monotype in their practice. Monotype designates a unique work produced by transferring ink from a non porous, unaltered matrix, such as Plexiglass or metal, usually to paper, with a press or by hand. For many artists, the challenging art market does not sustain the demand for large editions. 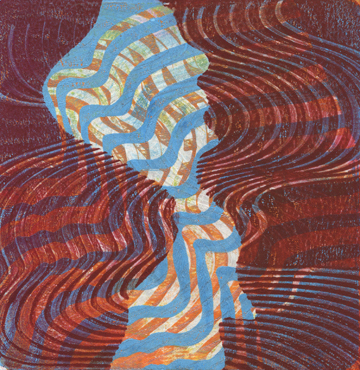 For others, years of rigorous editioning, often with toxic products, have left them yearning for a freer, faster, non-toxic, more experimental approach to printmaking. The Gelli monotype fits the bill perfectly. 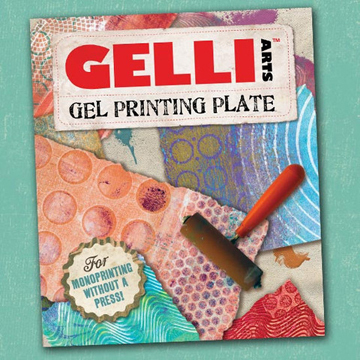 The Gelli is a gel plate made with mineral oil and is a hypoallergenic polymer material. It does not contain any animal products or latex and is non-toxic. 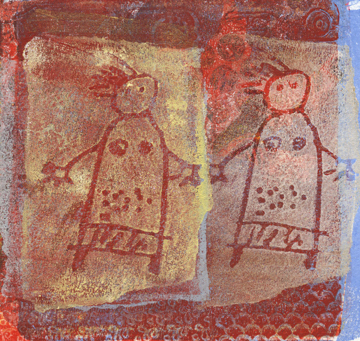 With proper care, Gelli plates are durable and long-lasting. The plate was developed in the States by Joan Bess and Lou Ann Gleason, with a view to creating a non-perishable printing plate that has the same sensitive surface as gelatin, that is used in gelatin printing. On the last day of a monotype workshop that I gave at Atelier Circulaire, one of my students gave me a Gelli plate as a present to express her appreciation. I was flattered and excited, as this was a technique that I had been wanting to experiment with. Over the past few months I have been indulging in long, blissful Gelli sessions, discovering a myriad of special effects. This uncomplicated, fast technique not only yields beautiful prints, it enhances the spontaneous nature of monotype printing. The fact that one does not need a press for Gelli makes it very user friendly. 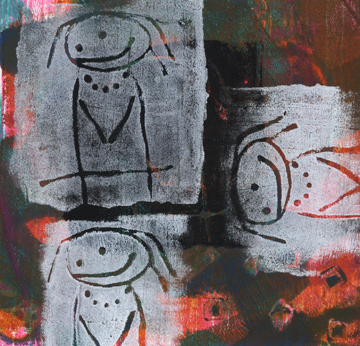 I’ve been using acrylic paint with Gelli, which gives the images a bit of a painterly effect. Liquitex Basics and Dollar store craft acrylics work well. I explore multi-layering of rolled surfaces, combined with stencils, stamping, pressed textures and combed effects. 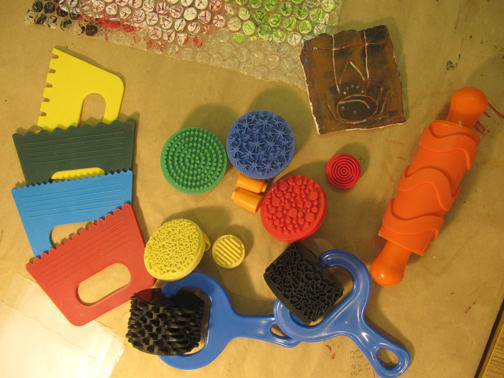 I stocked up on a number of new tools, from textured brayers and stamps to textured plates for rubbing art. 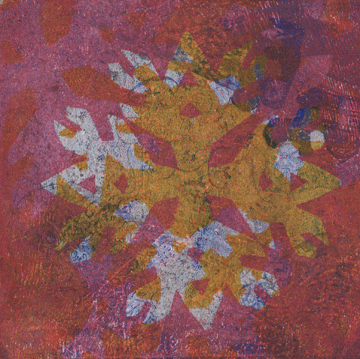 Talleen Hacikyan, Paper Flake, Gelli monotype, 2014. This versatile technique is perfect for both experienced and aspiring artists. 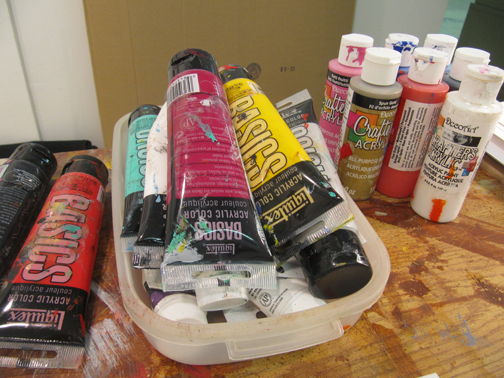 Gelli produces professional quality monotypes. It is also suitable for card making, visual journaling or crafts projects. 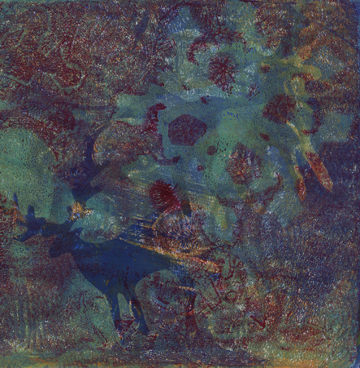 Talleen Hacikyan, Blue Deer, Gelli monotype, 2014. 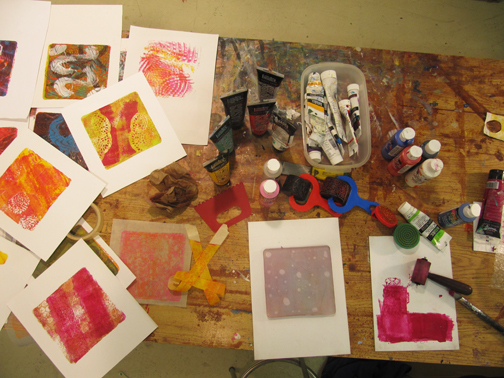 I look forward to sharing the joy of Gelli with other artists in future workshops. Thank you, Manon, for your kind gesture. 40 requêtes. 0, 187 secondes.